The Woolwich foot tunnel passes under the Thames as an alternative route to the ferry. Built in 1912 at a time when the Docklands was a hub of industry a welcomed route for the many workers of the period. The tunnel was closed for just over a year from 2010 to upgrade and repair structural weaknesses. Great perspective. It looks endless! 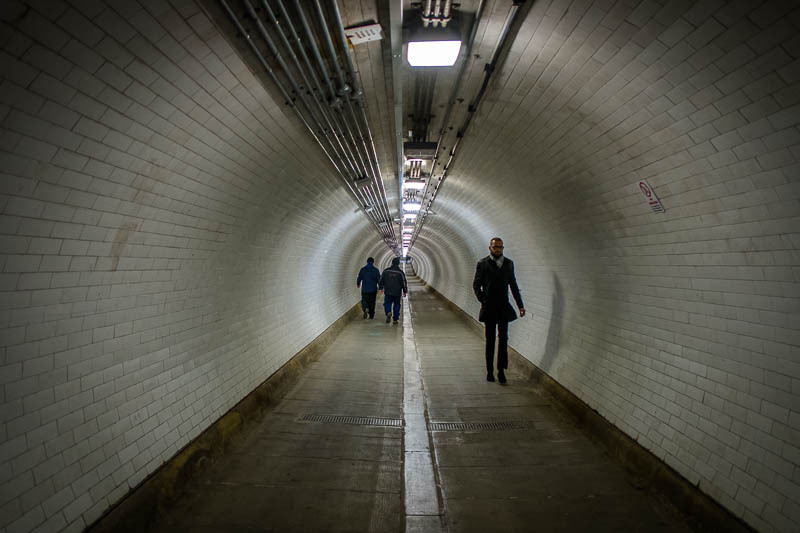 I've used the Greenwich foot tunnel, but didn't realise there was a Woolwich one. They look very similar. It does look endless. i wonder how long it takes to walk through. I think I would be nervous but it would be interesting to walk it. This is interesting. I didn't know a tunnel under the river existed. I'm reminded of the tunnel network beneath my campus. Oh, I knew there was a foot tunnel at Greenwich but didn't know about this one. Hmmm. I'll have to get exploring. Probably not for the claustrophobic...right? Interesting, though. That must have been in a few movies? Nice shot. This reminds me that I was watching The Tunnel series before I left for South Africa. I think I recorded the shows I missed. Must go check, after the Olympics.